Herrmann B, Johnsrude IS (2018). Attentional state modulates the effect of an irrelevant stimulus dimension on perception. Journal of Experimental Psychology: Human Perception and Performance 44:89-105. The sounds common in everyday life, such as speech and music, are acoustically complex but redundant in that acoustic features co-vary. For example, temporal modulation rate and frequency change together in consistent ways; increases in the rate of speech and music are associated with increases in fundamental frequency and note frequency, respectively. Indeed, perceptual experiences can be shaped by featural co-variations occurring in sounds. For example, speech rate or the tempo in music is perceived as faster when vocal frequency or note frequency increase. And yet, do cognitive states and situational demands alter the degree to which perceptual decisions are shaped by correlated features? We examined the influence of a sound's frequency change on perception of modulation-rate change. We utilized sounds with linearly changing (decreasing or increasing) amplitude modulation rate and carrier frequency. The changes in the two dimensions were either consistent (i.e., in the same direction) or inconsistent. The figure below (left) shows the spectrograms of four sample stimuli (darker colors represent greater stimulus energy). Participants were asked to judge whether a sound was slowing down or speeding up in modulation rate, while ignoring changes in carrier frequency. The right-hand side of the figure above shows the influence of frequency change on modulation-rate change judgments. Participants perceived the sounds as speeding up when the modulation rate increased and as slowing down when the modulation rate decreased. 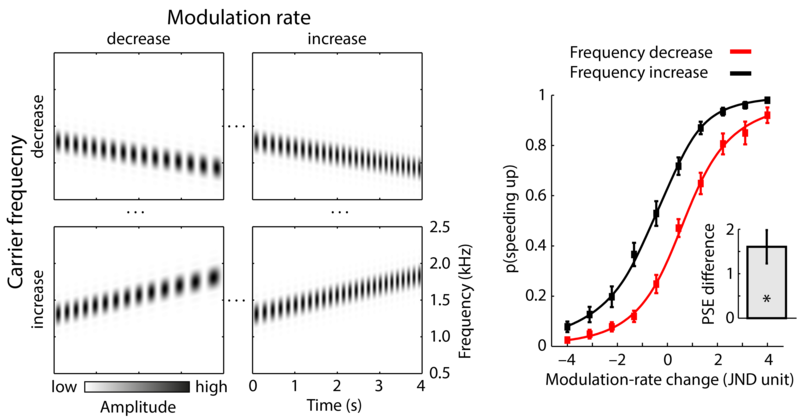 Critically, when frequency decreased (red line) participants tended to perceive the sound as slowing down and when frequency increased (black line) they tended to perceive the sound as speeding up. This "rate-change illusion" can be quanitfied as the difference between the point of subjective equality (PSE) of the psychometric functions for frequency increases and frequency decreases (single gray bar in the figure). We then tested whether providing informative cues prior to sound presentation enables participants to regulate their attention to the upcoming sound depending on its predicted degree of difficulty. We hypothesized that knowledge about whether a trial would be easy or difficult (informative cue; letters E and D, respectively, prior to sound presentation) would reduce the magnitude of the rate-change illusion compared to when no such information was provided (uninformative cue; letter N, for neutral, prior to sound presentation). 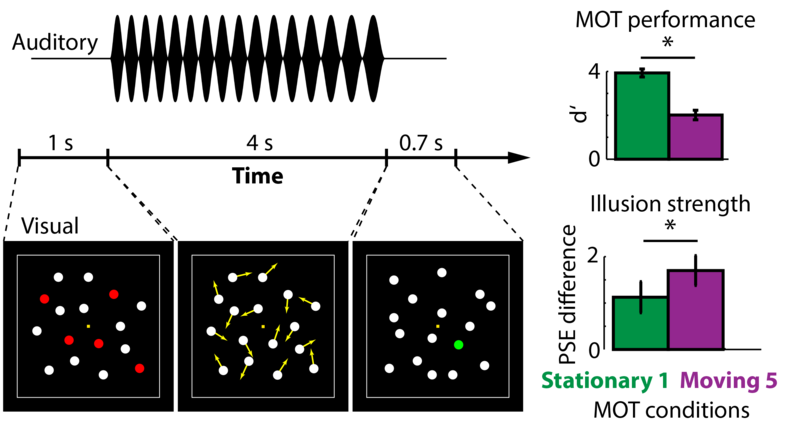 The figure on the top right shows the stimulation design (left). We observed that the rate-change illusion (i.e., the influence of a frequency change on modulation-rate change judgments) decreased for informative compared to uninformative cues. The result of this experiment reveals that information about a sound’s acoustic features can help to reduce the influence of frequency changes on perceived modulation rate. Informative cues might have allowed individuals to specifically increase attentional focus for trials indicated as being difficult. In Experiment III, we investigated whether a distractor task affects the influence of carrier frequency on rate-change percepts. We utilized a multiple object tracking (MOT) task: Participants had to track either one or five dots over time. In the low-load condition, participants tracked one dot on a stationary display. In the high-load condition, participants tracked five dots on a moving-dot display. Participants also judged whether a sound that was played concurrently with the dot display was slowing down or speeding up. The left-hand side of the figure below shows the experimental desgn. The right-hand side of the figure above shows the results. The performance in the MOT task was lower when participants tracked five moving dots over time compared to tracking on stationary dot. Tracking five moving dots likely required more attention and thus distracted more attention from the auditory stimulation. Critically, the rate-change illusion (i.e., the influence of a frequency change on modulation-rate change judgments) increased when participants were distracted by tracking five moving dots. The current study investigated whether co-variations of acoustic features in sounds are utilized in a stable manner or whether their role in perception depends on the degree to which the listener is attending to the sounds. Critically, the influence of the correlated (but irrelevant) dimension decreased when listeners received an informative cue beforehand, and increased when a concurrent, distractor task had to be simultaneously performed. These data suggest that when a listener is not optimally attentive, he or she might rely strongly on learned featural co-variations for sound perception.